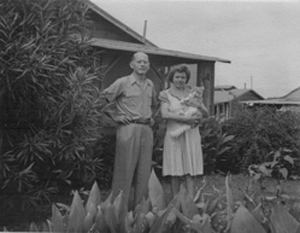 My father and mother, George Neupert and Emma Hoechner Neupert, were both born in Germany. My father and his sister emigrated to the United States in 1928, and my dad brought my mother over the following year. My parents were married in June, 1931, and I was born on October 10, 1932 in New Jersey. My father became a U.S. citizen, but my mother retained her German citizenship and was here as a resident alien. After Pearl Harbor we had numerous visits from the FBI. I remember a number of their visits in the middle of the night, my mother waking me up and staying with me as the FBI men searched our home and went through our belongings. They took some of our things with them – my father’s books, other items. I remember them asking if we had any guns and my showing them a toy plastic gun that I had. The visits were frightening; sometimes they came at our dinnertime, as we were eating. There were many such visits. In the summer of 1942, the FBI came to our home and arrested my mother. My father and I stood at our kitchen window and watched them leading my mother away. It was the first time I had seen my father cry. It was too late in the day for my mother to be taken to Manhattan, so she was locked up at our local police station until the following day when she was brought to Ellis Island. My father lost his job and could not find work because he was blacklisted. He boarded me with friends in our home town, so that he could keep looking for work. He would come over in the evenings and have dinner with us. Around this time my father started to have heart trouble. He had angina pectoris (this was prior to bypass surgery and angioplasty) and was told that he must avoid stress and worry to keep from getting more seriously ill, advice that was impossible to follow. We were allowed to visit my mother once a week, on Saturday, and my father and I would go to Manhattan and take the ferry to Ellis Island. My dad would fill a suitcase with food for my mother. As soon as the ferry docked, I would run on ahead, into the building, my father following, so that we would be first in line to go through a baggage search, because we didn’t want to lose a minute of the limited amount of time we could spend with my mother. Once our things had been searched we sat at long tables that had a divider in the center, my mother on one side, we on the other. We were not supposed to cross over the divider, but I would kiss my mother and so would my father. I had to change schools once my mother was taken away, when I went to live with our friends. One day people from the Child Welfare Board showed up at my school and interrogated me. When my father found out he was outraged and frightened that I would be taken away so he contacted my mother and somehow they were able to arrange for me to be with her on Ellis Island – this was in December, 1942, and I was ten years old. The next Saturday my father took me to Ellis Island with a suitcase of clothing, and left me with my mother. On Ellis Island we spent our days in the Great Hall, an enormous room that was dingy, dirty, and grey with age. It was filled with very long benches, and the women who were imprisoned there moved them around to form squares, sort of imaginary rooms, where they sat during the day. The building was alive with roaches; every time anything would be moved, the roaches would scurry about. The women tried to find activities to keep themselves busy and to keep their minds off their problems: They painted, crocheted, knitted, and sewed. There was nothing to do other than stay in this huge room. We were allowed to go outside, in sort of a triangular area, for a short time each day. Everyone went out and walked about. We could see the Statue of Liberty and the skyline of downtown Manhattan. At night we slept in the rooms that led off the balcony that ran around the Great Hall. The rooms were tiled, and had a lavatory in each room. There were about eight women in our room, and two children. I remember a woman complaining because I had nightmares and woke her up. We were locked in each night and there were two small barred windows set up high in the wall. On Saturdays, when my dad came to visit us, I would stand on a dresser and pull myself up to the windows to see when the ferry had arrived, and then we would go down into the Great Hall and wait for my dad to come and see us. He would bring us food because what we were given on Ellis Island was almost inedible. For the few children who were there a special menu was served, and I would take my plate to my mother who would try to make the food more palatable by doing things like removing the skin from chicken because it had only been partially plucked. The food that my dad brought supplemented our diet and meant that we didn’t have to eat the worst of what we were given. 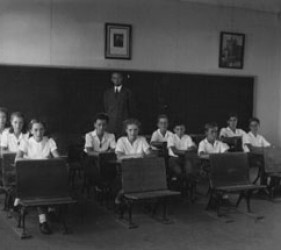 A social worker came to Ellis Island to hold classes for the children for a few hours each week. At some point I was sick and was sent to the infirmary for a few days – I’m not sure what was wrong with me, whether food poisoning, or some other illness. My mother was allowed to visit once. I remember begging the staff at the infirmary to give me something to do to keep busy. The only outside group that seemed to know of our existence was the Salvation Army – they held services every Sunday, and we all attended. I still try to contribute to their organization in gratitude for the comfort they brought us. All the time my mother and I were on Ellis Island my father was still trying to find work and even though tool and die makers were sought after, he was refused all jobs he applied for. The FBI was still coming to our house and questioning my father. In the spring/summer of 1943, my dad’s citizenship was revoked and he was also arrested and brought to Ellis Island. He lived in the men’s section but was allowed to see us at designated times of the week. During their time on Ellis Island my mother and later my father appeared before the hearing board; they were interrogated but they had no one to represent or defend them, nor did they have an opportunity to have character witnesses or present any evidence. I don’t think they knew what the charges against them were. My mother was terribly intimidated by the questioning. Years later, after our release and after the end of the war, she was desperate to go to Germany in 1952 to see her father since he was ill and she was afraid she would not be able to see him again before his death. She had to appear before what I believe was an Immigration and Naturalization Board to get permission to leave the country and be able to return to the USA. I was with her at this hearing and she was so upset that she couldn’t speak. I remember answering questions for her. 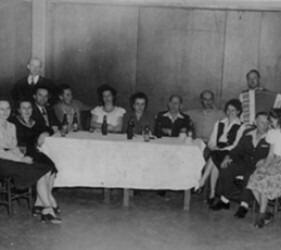 While we were on Ellis Island, my parents requested permission to be sent to the family internment camp at Crystal City so that we could live together as a family. In October of 1943, (just after my eleventh birthday) we left New York for Texas by train with a group of other families and guards. I think the train headed north through New York State. I remember that we stopped at a station and a crowd of people was there, looking in at us as though we were on display. When we got to Texas we were assigned living quarters. 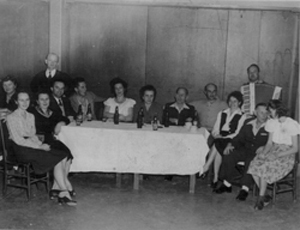 We were housed in rectangular barracks that had been divided into four rooms. My parents received an end room, and the next room was divided with a half wall to create an area for me (we had 1 and ½ rooms). If your family was larger you got additional space. Toilets, showers, and wash tubs to scrub clothes were in a separate building. The camp was divided between German and Japanese internees and it seemed very large to me; it had a small orange grove at the Japanese section. The camp was encircled by a high chain link fence crowned with barbed wire and had guard towers and searchlights at regular intervals. I don’t remember being able to see much except desert outside the camp. 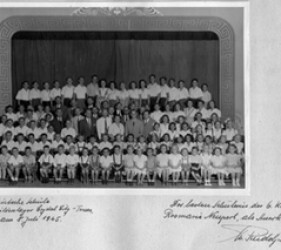 Because there were many German teachers who had been brought from South/Central American countries to be interned in the USA, a German school was created for all the German children; there was also an American school which was attended by the Japanese children. Because most of the German children could speak but not read or write German, we were set back a grade. All of our subjects were taught in German. 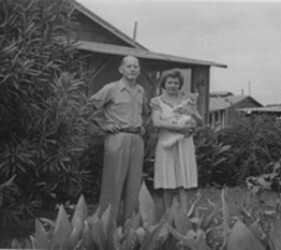 While we were in Texas my father’s heart condition worsened, and he was hospitalized at the camp infirmary for a time. People could sign up to be repatriated to Germany, and some did. My parents did not want to go back to Germany since they had made a life for themselves in America, and I had been born here. But there was always the fear that you would be involuntarily repatriated. There was a constant stream of rumors and an undercurrent of uncertainty and fear about the future and concern about what would happen to us. The worst part was the insecurity; we had no control over our lives. Everyone tried to keep busy. My father became a craftsperson; on a lathe he turned lamps and vases from scrap wood. He carved and painted birds copied from an encyclopedia, and made them into broaches by inserting small safety pins into the backs; he made jewelry boxes for my mother, my aunt, and me out of wooden matchsticks. My dad was also a member of the fire department and was paid prisoner of war wages: 10 cents an hour. We had “money” made of cardboard and could use it at a canteen in camp to get fabrics and other items. Since we all “bought” the same items from the same store, someone’s curtains would be made of the same fabric as someone else’s skirt. My dad, before he was arrested, had placed a few of our household goods into storage (I now have one of those pieces, a secretary, in my home), so there was great concern about being able to pay the storage charges and not losing any more of our possessions, since everything, aside from what my father had stored, was gone. My mother crocheted baby items for a store in New Orleans, and when the woman who was handling the finished items was released from camp she asked my mom to take over. My mother would receive all of the materials by mail, distribute them to the women (and men) who made the items, and then send the completed items off. I crocheted too. We received $1.00 for each pair of baby booties we sent in. 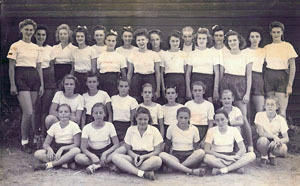 At German school we had gym classes; we played basketball, we presented plays, we tried to live as normally as we could. We were able to send mail out of camp, but it was restricted and heavily censored, and portions of letters would be blacked out. As I recall, our letters were stamped to indicate that they were Alien Enemy Mail, so we wrote to my aunt and uncle in New York and our relatives in Germany, but hesitated to send mail to friends who might be intimidated by receiving such stamped mail. We occasionally were shown films out of doors; we would all bring chairs to an open area, to watch. When the sandstorms came up we would all run for cover. I believe it was in 1945 that the South and Central American internees were released and returned to their homes. 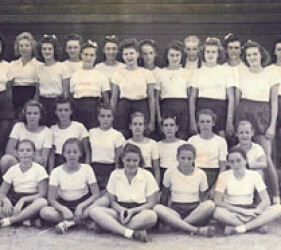 With the departure of the German teachers, the German school was closed and that fall I attended the American school that was staffed by teachers from outside the camp. I was moved up a grade which put me into a class with Japanese students my own age. I made friendships there which I still cherish. 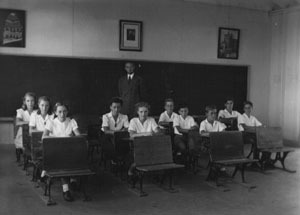 I attended American school for a year, but then the American school was also closed because many people were freed from internment. Faced with either keeping me with them and having my schooling end at the eighth grade, or sending me to my aunt and uncle in New York so that I could continue school, my parents decided to have me go to New York. 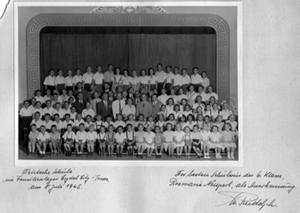 I left Texas by train in October, 1946 (I was fourteen), and traveled with a family that had been released from camp. My aunt and uncle had no children, and I think it was quite a burden for them to have to be responsible for a frightened and lonely fourteen year old. I started ninth grade in Flushing, New York. My parents remained in Texas until the following year, when the camp was closed. I have letters I sent to my parents dated May, 1947, in which I write of my joy at their coming to New York soon and telling my dad that if they kept him at Ellis Island we would visit him as much as we could. I believe my parents were among the last group to leave Texas before the camp was closed. My mother was released and came to stay with my aunt, uncle, and me, and my dad was sent to Ellis Island. My mother and I then visited him every Saturday and brought him food. By then we were able to find a lawyer who would take my dad’s case which involved five or six men seeking to have their U.S. citizenship reinstated. 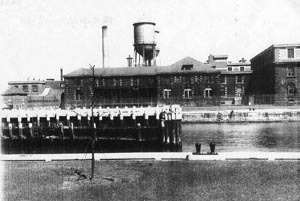 I’m not sure of the date, but after my dad had been on Ellis Island a few months we received a call from him that the men on the island had been told to prepare for deportation. This was to occur over an upcoming holiday weekend. We were unable to reach my dad’s lawyer. We went to Ellis Island on the next visiting day, and wept as we said goodbye to my dad, thinking that he would definitely be forced to leave the United States, and, because his heart condition was steadily worsening, that we might never see him again. The lawyer’s offices were in downtown Manhattan, so after saying goodbye to my dad we, in desperation, went to the lawyer’s offices, luckily found him there, and he was able to get a stay to keep the men he was representing from being sent back to Germany. As I recall, my father later told us that his luggage was already on the ship tender. After this shipment of deportees was sent to Germany my father was finally released. By this time my aunt and uncle had sold their home and moved, and my mother and I had gone back to live with our friends in New Jersey; this was where my mother, father, and I lived for a time after we were all free. My father had to report in person to a parole officer on a weekly basis, so it was impossible for him to work full time. Then he was allowed to call in, and finally he no longer had to report at all. My father’s heart condition was painful and debilitating, but in spite of this he found a job and continued to work as a tool and die maker until shortly before his death. My mother found work as a salesperson in a bakery; and we were finally able to leave our friends’ home and find an apartment, as we tried to put our lives back together. I graduated from high school in New Jersey and went on to college. My father’s health continued to deteriorate to the extent that he was unable to walk the length of our apartment without taking nitroglycerin tablets. In 1956 the men’s legal case finally came to court and was decided in their favor. They had their citizenship papers restored, but unfortunately, the decision came too late for my father, who died at age sixty, on May 17, 1956. He had worked full time until two weeks before his death. In the following years, my mother could speak superficially about the time in Texas, but was so traumatized by those years that she found it almost impossible to discuss in detail what had happened to us. She would break down in tears, and so we talked only of the lighter moments of our imprisonment. And we never discussed Texas with anyone other than people who had been there, or who knew us prior to the war. How to explain being imprisoned when we weren’t sure why it happened to us, and there was also an element of shame involved – would people understand or would they misjudge us? We were also trying to repress the memory of that time of uncertainty and fear. My mother died on November 1, 1998. This is the first time that I have written down my recollections of those years; it’s been difficult and painful to remember. I believe that the years of imprisonment had an impact on us not just while we were living through them, but also for the rest of our lives.